Congratulations to the following students on their election during the annual Districtwide Student Government leadership conference hosted by Kenai Central High School, September 12, 2018. Superintendent Sean Dusek opened the day, Senator Peter Miccichi offered a keynote address, and elections took place for student representatives on district committees and the KPBSD Board of Education. Throughout the day, everyone had a chance to attend three workshops, the class presidents and their respective advisors met separately to talk about their schools and plans for the school year during the President Meeting. 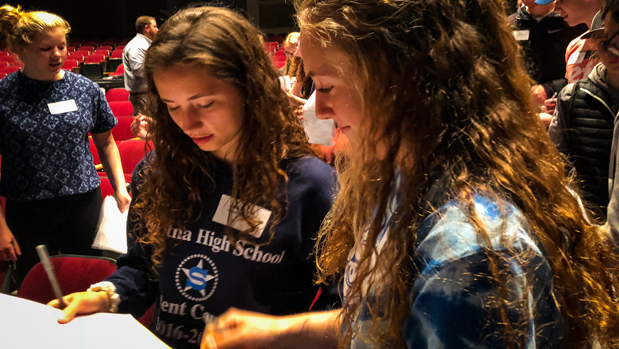 New friendships formed, teams strengthened, and student leaders learned skills to become effective advocates to share their stories and serve in their schools. Thank you to everyone who volunteered, and helped to plan and implement the 2018 event!